We offer three (3) quality Eye Surgery Recovery rental packages for every type of customer based on your needs. Individual equipment rentals are also available. When scheduling in advance and using the least expensive ground shipping with FedEx, rental equipment arrives the day before your first rental use day. Courier service in the Chicago area typically arrives the same day - please call us for courier quotes and give us the dropoff and pickup times you will need. For last minute orders, you may select faster 2-day or overnight options, and we will ship it as quickly as possible. Rental return labels are provided in a clear plastic sleeve on the inside of the box flap. Slip return labels into the sleeve on the outside of the box & drop at any FedEx Kinkos, or call 800-GOFEDEX for a pickup (pickup charge may apply). If there is already a FedEx ground pickup, they will take our boxes with the enclosed labels. Online checkout- just Add to Cart and go! 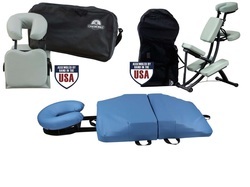 The Eye Surgery (Vitrectomy) Recovery Comfort Package Rental is our most versatile, supportive face down solution for staying in compliance with the positioning requirements needed for eye surgery recovery both day and night. Using all three pieces, this face down solution will assist you in a speedy and good quality vitrectomy surgery recovery all while supporting your head,neck, shoulders and back. The comfort package is optimal for changing position throughout the day, preventing patients from rolling out of position at night and for a speeding eye surgery recovery. Best package for staying in compliance day and night. Enjoy all three pieces to maintain face-down compliance, a faster recovery time with quality results whilst you recover. The Eye Surgery (Vitrectomy) Recovery Basic Package is optimal for those looking for a daytime and night-time face down solution. 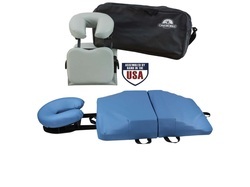 Get all the support and nighttime roll prevention the Basic Package has to offer without breaking the bank. 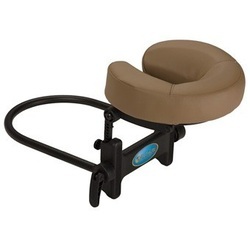 With the Basic Package for Eye Surgery Recovery, the Oakworks Seated Support Chair and 3 Piece Sleep System will assist you in a speedy and good quality vitrectomy surgery recovery while offering more support for your head, neck, and shoulders, as well as your back and knees. The Economy Package for Eye Surgery (Vitrectomy) Recovery is a great face down solution for both daytime and night-time support for your head, neck, and shoulders. The Desktop Unit and 3 Piece Sleep System prevents patients from rolling out of position at night, helps to maintain face-down compliance, and assists you in a speedy, high quality eye surgery recovery without breaking the bank. The Economy Eye Recovery pack is lightweight, making this package the least expensive face down solution for vitrectomy surgery recovery to be shipped express. Did you know we also have disposable sheets, face cradle covers, washable sheets, bolsters, & sanitizing products available? They are lightweight & easy to add to your order.